The third annual Bike 5 Cities is almost here! Join us on this 28-mile bike ride through Central Florida as we explore bike trails and bike-friendly roads. 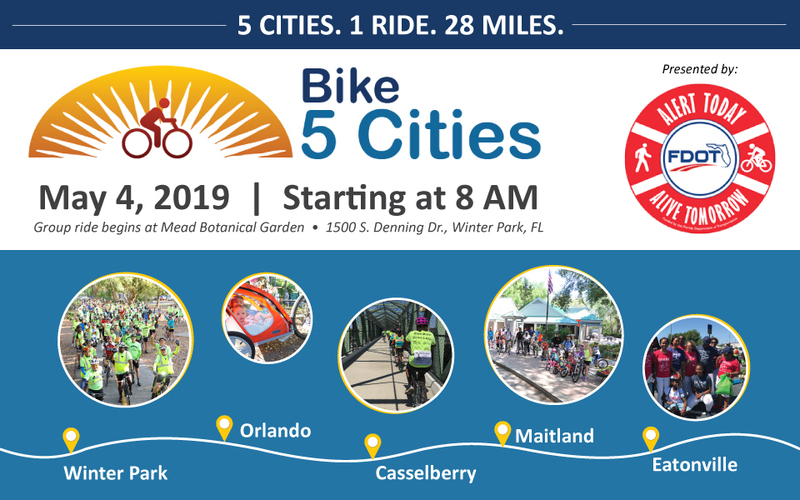 Riders of any age, experience or ability level are encouraged to ride as we take on the routes that connect Winter Park, Orlando, Casselberry, Maitland, and Eatonville. UPDATE: as of 4/22, our escorted ride is at capacity. However the course will be fully marked this year, and riders are welcome to start from any of our 5 cities and ride independently or in smaller groups. Register by April 24 to get a free t-shirt. NEW THIS YEAR! riders will have the option of partaking in the group ride or riding by themselves or with a smaller group of friends by starting in any one of our five cities. Those riders just need to visit a registration table to check in and grab their t-shirt and map at any location between 7:30 and 10 am before taking off. All riders can join us afterward for post-ride refreshments at Mead Garden around 1 pm. The registration deadline is April 30th, and the recommended minimum donation is $15. Helmets are mandatory and aid stations will be located in each city.